The latest addition to McGraw-Hill’s “All About” series is All About Investing in Gold: The Easy Way to Get Started by John Jagerson and S. Wade Hansen, founders of the website Learning Markets. Earlier they wrote All About Forex Trading and Profiting with Forex. The book is a bit of a jumble. There’s a lot of material in it aimed at a wide swath of investors and traders. It deals not only with topics specific to gold but with how to pick the right broker, technical analysis (with an emphasis on Fibonacci retracements, projections, and fans), and option strategies. Along the way there are useful pieces of information, some very useful indeed, but it’s left to the reader to sort things out. The reader who needs help avoiding a mail-order counterfeit gold scam is probably not the same person who is interested in the damage caused by contango in a futures-backed gold ETF. The authors are active traders who were clearly chomping at the bit in the chapters that provide gold market background, identify the major players, and outline the fundamentals of the gold market. They wanted to get to the meat of the book: strategies for making money investing in or trading gold. Curiously enough, to my mind at least—and this cuts against “my” grain—these chapters (particularly the ones on the major players and the fundamentals) may be the most rewarding for the gold investor. Although the authors believe that gold has a bright future, they acknowledge that over the very long term gold remains relatively flat. And yet this very ability to preserve value over the long haul and to reduce portfolio volatility makes gold a good asset for diversification purposes. For buy and hold investors the authors recommend allocating a “substantial” portion of the portfolio to ETFs such as GLD and GDXJ. Active traders might consider trading the gold-to-silver ratio or using gold stocks and gold together. They could use the COT report as a trading tool. Or, if their accounts are large enough, they could sell naked puts or increase leverage with synthetic positions. The authors point out some of the substantial downsides of all these strategies. Both gold and options are “hot” topics in the trading world, and novices are eager to sign on to both. It may be relatively easy to get started investing in gold products, but it is decidedly not easy to ratchet up profits using options. All About Investing in Gold should be read as a primer, not as a trading plan. How many really good ideas do we have? Aside from the brilliant insights I have in my dreams that quickly fade in the light of day, I’m no idea machine. So I set the bar quite low when I judge books: if I encounter at least one intriguing idea or one potentially profitable suggestion I consider the book a worthwhile read. By contrast, the editors of The StockTwits Edge--Howard Lindzon, Philip Pearlman, and Ivaylo Ivanhoff--aimed much higher. The subtitle of this new release from Wiley is 40 Actionable Trade Setups from Real Market Pros. For those unfamiliar with StockTwits, it is a networking site for investors, “a global trading floor that collectively digests and shares prices, ideas, and news.” (p. 4) The editors are either principals or employees of StockTwits. Fortunately, the site needs little self-promotion; it has over 100,000 users. So, instead of being a blatant advertisement for the site, the book shares some of the site’s best ideas. For the book’s forty-six chapters (I don’t know whether the editors actually counted the number of trade setups and found six chapters wanting) the editors draw on the expertise of professional traders as well as traders who have attracted a following on StockTwits. The chapters are necessarily brief (about eight pages each on average), but therein lies their strength. No rambling or boilerplate here. It seems that the authors were given a two-fold task: to recount how they came to embrace trading/investing as a life passion and to describe their favorite trade setup, preferably with illustrative charts. Several authors opted to add words of wisdom on topics ranging from preparation to risk management. The book is divided into seven unequal parts: trend following, value investing, day trading, swing trading, options trading, forex trading, and the art of trading. Although the divisions make eminent sense, the reader shouldn’t pick and choose his way through this book. There are often insights in unlikely places. The normal trading book takes about ten solid pages of ideas and stretches them to two hundred or so. The advantage of The StockTwits Edge is that it is concentrated. There are lots of ideas to mull over and (presumably) forty setups to try or reject. To close on a somewhat whimsical note, one of the subheads in the book reads “When elephants dance, they leave traces.” That brought to mind another ending to this sentence: “When elephants dance, it isn’t safe for the chickens.” I think both endings apply to the markets. I'll update this list as I receive payment for books. In a couple of cases I had two copies, so even though I've sold one the title still appears on the list. My bookshelves can no longer accommodate, so it’s time for some serious housecleaning. My first instinct was to be charitable, but the local library is not the least bit interested in adding free investing/trading books to its collection. In deference to the publishers who so kindly supply me with review copies, I am not offering anything I have reviewed in the last six months. Hooke, Security Analysis on Wall Street, 1st ed. How can I read books when I’m creating a Rube Goldberg TV? Comcast is transitioning to all-digital in my area, which theoretically means I need a set-top box for the “main” TV and a DTA (ugly little box) for all other TVs. Here’s my retro setup. I have two analog TVs. One occasionally keeps me company during the day, and it is happy with the tiny box and the huge looping white coaxial cables. The other TV (which I either watch while exercising or fall asleep on) is what Comcast considers the cash cow, for which I need their cable box. The problem is that I also have a series 2 dual tuner Tivo and a DVD recorder. After a lot of experimenting, it seems I will need a three-way splitter and two additional DTAs to make this combination work. I’m allergic to inelegant solutions, and this is decidedly inelegant. And time consuming! But stay tuned. On Wednesday I’m going to offer some books for sale at half the Amazon price (plus shipping) on a first-come, first-served basis. I’ve run out of book shelf space. Anyone who trades using technical analysis would do well to read MIDAS Technical Analysis: A VWAP Approach to Trading and Investing in Today’s Markets (Bloomberg/Wiley, 2011) by Andrew Coles and David G. Hawkins. It’s not that the MIDAS method, pioneered by Paul Levine in 1995, is the holy grail. I recommend the book because the authors have done such a thorough job of explaining and, after extensive research, expanding on the notion of volume-weighted support and resistance curves. In the process they touch on a wide range of technical approaches to the market, some of which I suspect will be unfamiliar to the majority of readers. Coles and Hawkins, like so many who end up in technical analysis and trading, have academic backgrounds. Coles earned a Ph.D. from the University of London with a dissertation on biological themes in philosophy and medicine in ancient Greece. Hawkins has an M.S. in physics from Brown and taught at the university level. And the original developer of MIDAS was a theoretical physicist with a Ph.D. from Caltech. “Overeducation” can sometimes result in overthinking a problem. Midas Technical Analysis exhibits its fair share of overthinking, but that doesn’t mean that it’s merely a theoretical study. Far from it. The MIDAS method was a development of or variation on VWAP (volume weighted average price). First, Levine modified the original VWAP formula. Second, he thought it important to anchor his support and resistance curves at a point where there was a change in the underlying psychology. That is, “instead of ‘moving’ averages, one should take fixed or ‘anchored’ averages, where the anchoring point is the point of trend reversal.” (p. 11) And third, he believed the markets to be fractal. Coles and Hawkins start from the basic MIDAS premises, but they set out to develop a full trading system, not just a forecasting method. The two authors work on different time horizons: whereas Coles trades intraday, Hawkins focuses on longer-term charts. And they presumably have different interests as well. So each chapter in the book has a single author. The chapters cover a broad range of topics. For example, MIDAS curves and day trading; applying the topfinder/bottomfinder to investor timeframes; equivolume, MIDAS, and float analysis; standard and calibrated curves; MIDAS and FX; MIDAS and the Commitments of Traders report; a MIDAS displacement channel for congested markets; and MIDAS and standard deviation bands. Appendixed to the text is MetaStock code for the standard MIDAS S/R curves and TradeStation code for the MIDAS topfinder/bottomfinder curves. The trading plan the authors present is discretionary. There are no hard-and-fast buy and sell rules, though Hawkins offers a set of directions. Judgment is required throughout: for instance, where to anchor a curve, how to interpret multiple timeframe curves, and what kinds of market data to consider in addition to what’s on the chart. In this more than 400-page book Coles and Hawkins take the reader down highways and byways, describing the scenery all along the way. Some of scenery is Kansanian (with due apologies to any readers from Kansas), but much is intriguing. The book is, to shift metaphors, definitely several cuts above the standard technical analysis fare. As I was cleaning out my e-mail, I revisited an old (maybe 2009?) program from the Cornell Creative Minds Lab named Eureqa (and of course pronounced “eureka”). Well, “revisit” is the wrong word. Originally, I downloaded it, played with it briefly, and set it aside. And then when I had to reformat my hard drive recently—one of those incredibly annoying, time-consuming chores—I didn’t reinstall it. I can only play at being a geek, not actually be a geek. Eureqa is, as described on its website, “a software tool for detecting equations and hidden mathematical relationships in your data. Its goal is to identify the simplest mathematical formulas which could describe the underlying mechanisms that produced the data.” And if past is prologue, can project into the future. Well, maybe. For those of you with time on your hands and a penchant for data mining who somehow missed this piece of free software, you can download it here. Unless markets are absolutely comatose they swing. There are swing points in uptrends, downtrends, and sideways movement. Ideally the short-term trader buys close to the low swing points and sells close to the high swing points. The savvy trend trader ignores the minor swing points; he simply has to identify when he is about to overstay his welcome. All this is patently obvious in hindsight, hellishly difficult at the hard right edge. In Trend Qualification and Trading: Techniques to Identify the Best Trends to Trade (Wiley, 2011) L. A. Little offers what he calls a neoclassical model of trends that relies in large measure on defining and qualifying swing points. The classical model, developed and popularized by Charles Dow and his followers, has of late morphed into what one might call the reductionist classical model: “A trend is evident when two consecutive sets of higher highs and higher lows (uptrend) or lower highs and lower lows (downtrend) occur within any given time frame.” (p. 23) This reductionist model, Little argues, doesn’t work: for one thing, it triggers premature exits. Of course, nothing is ever so simple in trading. First of all, it’s important to identify swing points, both potential and actualized. Any current bar whose high is higher than that of the preceding bar has the potential to be a swing point high. It does not become an actualized swing high, according to Little, until it has remained the highest high for six successive bars. “The time element,” Little writes, “can be optimized for differing markets and equities, but my research has shown that six bars tends to represent the optimal ‘wait time’ across most equities, sectors, and general market indexes.” (p. 31) This can be six days, six weeks, or six months. Little offers numerous chart illustrations of potential and actualized swing points and of suspect and confirmed trends in a variety of market regimens. Little admits that “although trend theory is a necessary condition to trading trends profitably, in itself it isn’t sufficient. It is necessary to take the theory and integrate it into a workable and profitable trading system….” (p. 109) The second part of the book therefore deals with preparing to trade, entering and exiting trades, reversals and price projections, time frames, the trading cube, and trading qualified trends. Among the key concepts are anchor bars, which “identify chart price areas where significance exists” (p. 156) (as opposed to swing points, which normally define areas where a price boundary exists), and price zones (not lines). Naturally, some of the material in the second part of the book is familiar. We encounter, for instance, support and resistance (though viewed as zones, not lines), measured moves (AB = CD), and the usual catalogue of gaps. But Little integrates the familiar with his own contributions and illustrates his points with marked-up charts. Trend Qualification and Trading is an intermediate-level book for chartists. The only things on Little’s charts are price bars, volume, and labeled lines and zones that go far beyond the standard trend lines. For those who like to mark up charts, this book will be a satisfying read. For well over a decade, the Amazon Associates Program has worked with thousands of Connecticut residents. Unfortunately, the budget signed by Governor Malloy contains a sales tax provision that compels us to terminate this program for Connecticut-based participants effective immediately. It specifically imposes the collection of taxes from consumers on sales by online retailers - including but not limited to those referred by Connecticut-based affiliates like you - even if those retailers have no physical presence in the state. As a result of the new law, contracts with all Connecticut residents participating in the Amazon Associates Program will be terminated today, June 10, 2011. So I will no longer be picturing dust jackets and providing links to Amazon. Martin’s fund, headquartered in Indiana, has a value orientation. “[T]he long-term challenge for us as a small shop doing battle with the New York Yankees of the investment world is to use our minds (we don’t have the financial muscle) to do what Billy Beane does so extraordinarily: to find value where no one else can find value.” (p. 249) The fund, similar to most value funds, lagged during strong bull runs and excelled during sharp pullbacks. So it’s not surprising that Martin fretted as stocks got marked up way beyond what turned out to be their true worth. A footnote for fans of Jack Bogle: he wrote the foreword to this book. I was a slouch. Normally I check my links to make sure all is well, but today I didn't. And, guess what, the link was broken. So, for those who want to get to the Expiring Monthly site, here's the correct link (now fixed on the original post as well): Expiring Monthly. We can only hope that Expiring Monthly has no expiration date itself. 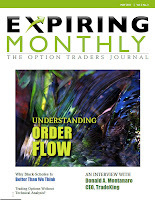 With Bill Luby, Mark Sebastian, Mark Wolfinger, and Jared Woodard—names that should be familiar to all options traders—as featured contributors, a spate of well-known guest contributors, and interviews with notables in the field, Expiring Monthly is a valuable resource for those seeking a solid options trading education. The monthly magazine, now in its second year, addresses traders at all stages in their education. Mark Wolfinger answers rookie questions and writes about basic issues. The other contributors tackle somewhat more complex topics, though nothing esoteric or quant-like. You would never mistake Expiring Monthly for Wilmott Magazine. One column that traders at all stages of their education can profit from is “Follow That Trade,” in which a contributor walks the reader through a hypothetical trade (sometimes a really bad trade) and how he managed it (again, sometimes poorly). For instance, Mark Wolfinger tracks a disastrous RUT trade where he bought three iron condors per strangle, made a delta adjustment along the way, and stuck it out to the bitter end even though “proper risk management would have forced a much earlier exit.” All that was left was a prayer that went unanswered. Mark Sebastian shares a successful surgical strike SPX calendar entered during the Egyptian sell off as well as an OEX butterfly. Bill Luby describes a silver and gold pairs trade that went against him. And, of course, there are the interviews, some with corporate types such as the CEOs of OptionsXpress and TradeKing and others with authors of hot-off-the-press trading books. Over the course of the last four issues Ping Zhou (Trading on Corporate Earnings News), Michael Benklifa (Profiting with Iron Condor Options), and Jeff Augen (Trading Realities, among several other books on options) shared their thoughts. But authors of legendary books are not ignored. 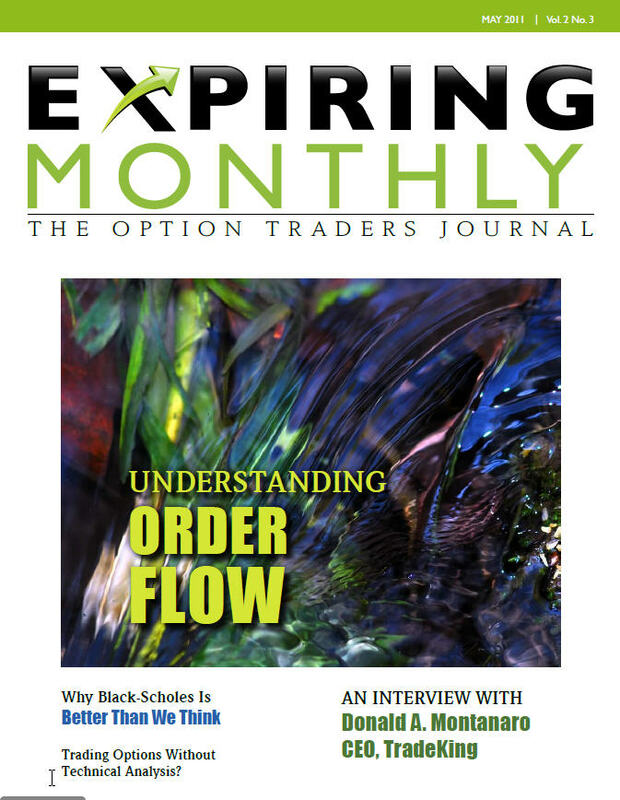 In the inaugural issue Sheldon Natenberg (Option Volatility and Pricing) was interviewed and, more recently, Larry McMillan (Options as a Strategic Investment). All in all, a nice publication, cleanly laid out and with limited advertising. On the Expiring Monthly website you can explore the archives of back issues and, of course, subscribe. Long-time readers of this blog may recall my rather lukewarm review of Barton Biggs’s novel, A Hedge Fund Tale of Reach and Grasp. By contrast, Todd A. Harrison’s The Other Side of Wall Street: In Business It Pays to Be an Animal, In Life It Pays to Be Yourself (FT Press, 2011) is a gripping autobiographical tale of reach and grasp. And, unlike Biggs’s novel, of self-styled redemption. Harrison, the founder of Minyanville (the redemptive part of the tale), recounts his days at Morgan Stanley, the Galleon Group, and Cramer Berkowitz from 1991 through 2002. These were heady times, and Harrison eventually became a prime player—and, in the process, a fractured soul. What Wall Street gives it can just as easily take away. Harrison’s disastrous First Interstate trade, where he was on the wrong side of an eight-figure overnight swing, didn’t cost him his job but it certainly shook his confidence. He bounced back, however, and by the age of 26 became one of the youngest vice-presidents at Morgan with a $300,000 compensation package. So on to Cramer Berkowitz in 2000, a much smaller fund, where Harrison would run the entire trading operation and would receive a “nice percentage of the profits.” (p. 73) And would reel when the towers fell and the market imploded. Harrison writes with intense passion about his time at Cramer Berkowitz where he not only traded but wrote ten to twelve columns daily for TheStreet.com. “When I wasn’t trading, I wrote, and when I wasn’t writing, I thought about what to trade or what I should write.” Especially after 9/11 “I was emotionally terrorized, although at the time I had no idea how damaged I was. … I was sleeping three or four hours each night, if that, but given my persistent nightmares, I wasn’t sure that was a bad thing.” (p. 116) Those who follow Jim Cramer, for whatever reason, will be especially interested in this part of the book. Enter Minyanville, home of Hoofy and Boo. “The specter of Minyanville rose like a phoenix from the scorched earth and rescued me from realities I didn’t want to face. … It was an escape, a corridor from a very painful place to a bright, animated world without terror or acrimony or politics or agenda.” (p. 125) And, finally, exit Cramer Berkowitz. Harrison didn’t run out of gas, though he was tested again and again. The Other Side of Wall Street is a tale of perseverance in the face of failure, of recalibration despite success. It’s one of those books you read in a single sitting (helped by the fact that it’s only about 170 pages long). A riveting story.